Metal filing cabinets are fine for the office, but when it comes to your home a wooden file cabinet definitely adds more warmth and character to your space than the standard gray, beige, white or black industrial type. Luckily, there are a plethora of choices to be found online and at your local furniture stores. These wooden beauties come in every shape, size, finish, color and price you can imagine. Although many of us now file away documents electronically in our computers, there is still a distinct need for filing away important papers, tax returns, titles, etc. that need to be organized and filed away for those "just-in-case" moments. If you are looking for a stylish way to hold these documents, start by looking at the resources listed below. You are certain to find one that fits your specifications, or at least get an idea of what you want to look for at a local furniture store. 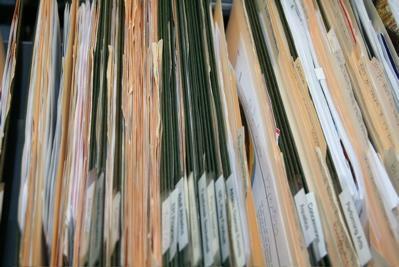 Just as the name suggests, this website has hundreds of different style of filing cabinets to choose from. Their selection of wooden styles is extensive, and includes a size, style, finish and price for every budget. Choose from the more traditional look of the Katy Ireland Home Vertical File Storage Cabinet in Distressed Cherry, or the small, portable and modern Nexera Mobile 3-Drawer Filing Cabinet. Those who have a penchant for a country or coastal style will love the Harbor View Collection Lateral File Storage Cabinet in Antique White. 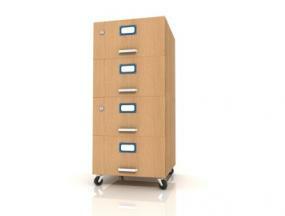 You won't find much more than filing cabinets on this website, and they offer an excellent array of wooden styles. If you don't need a lot of storage space for your files and also need furniture that does double duty, check out the Bush Sanford File Cabinet, which is small, durable and offers clean lines and a modern espresso finish. For those with a super-modern interior design aesthetic and are interested in eco-friendly materials, take a look at the Euro-Style Gilbert Filing Cabinet, which boasts a rolling base, is crafted from an eco-friendly laminated MDF, and is finished with a high-gloss onyx black. If you have some serious filing needs, look no further than HomeDecorators.com for some beautiful file cabinets that are big enough to hold a full home office worth of files. The Oxford 9-Drawer File Cabinet provides lots of space, brushed pewter hardware, durable wood construction and a hardwood veneer. If you need something more sophisticated, then look at the Shutter Four-Drawer File Cabinet, which has delicate finishing touches, solid wood construction, and comes in three finishes. If budget is your biggest concern, Staples.com has a few less expensive options that will do the job and still look good. Pick one from their two- and four-drawer wood veneer vertical file cabinets, which are priced below $100. You can also choose to spend a little more for a Altra Collection Lateral File in a cherry-wood finish. Once you have found the right wooden file cabinet for your needs make certain you check out all of the construction details, such as the drawers, the drawer pulls, and the interior hardware to make certain that it is durable enough to hold the weight of your files. You don't want to purchase something that will break within the first few months.